Britain's top basketball player, Luol Deng, has written a letter to Prime Minister David Cameron demanding that the sport's funding is restored. The sport was told last month it would receive no money for Rio 2016 - a cut of £8.5m from the London 2012 cycle. 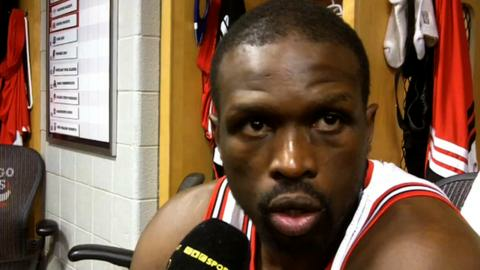 NBA All-Star Deng, 27, wrote: "I refuse to sit back and let that legacy be completely demolished for basketball." All sports affected have a chance to present their case for a reversal to funding body UK Sport on Wednesday. Deng - who was born in Sudan but became a British citizen seven years ago after going to school in Croydon, south London - was the star name in the Team GB side that was knocked out in the group stage at London 2012. The women's Team GB outfit also exited the competition at the bottom of their group. The small forward has excelled since joining the Chicago Bulls in 2004 and will play in his second successive All-Star Game - a representative match featuring the best players in the NBA - on 17 February. In December, UK Sport announced a record £347m worth of funding for Rio 2016, 11% up on London 2012, but basketball, handball, table tennis and wrestling lost all support. Those disciplines missed out due to the organisation's "no compromise" approach to focus on sports with genuine future medal prospects rather than the more general approach adopted for the home Games. "I, along with other people involved in the game, have put too much in and care too greatly to let this happen," Deng added. "The sport of basketball is a pathway, a pathway that teaches so many valuable lessons on and off the court, how are we supposed to motivate these kids to carry along their journey when there's now nothing at the end. No Team GB, no Olympic dream, no goal." The original decision about the level of funding was made after each Olympic discipline supplied UK Sport with a detailed plan evidencing their business case for investment which was allied to their potential to gain podium places in future events. Basketball - along with the other sports unhappy with the 2013-17 allocation that followed - have been invited to London on 30 January to make an "informal representation" to the full UK Sport board. Each representation will involve a 10-15 minute presentation followed by a discussion about each argument's merit, with a decision to follow on Friday. If the sports are still unhappy, they will have 20 working days from that date to make a formal appeal. Aside from that process, British Basketball is also considering lodging a formal appeal to the Sport Dispute Resolution Panel. An adjournment debate in Parliament on 'Funding for Basketball' will also take place on Monday night.